But it isn’t just money the founder of Zionism is concerned with: Herzl was also very unhappy with what he saw as the role of Jews in setting off wars and world conflicts. Needless to say of course, Herzl couldn’t know about what else was to come, decades later -- He didn’t know about Neo-conservatism; he didn’t know about Paul Wolfowitz and Scooter Libby setting the USA’s doctrine of moral interventionism; Herzl couldn't know that it would be the Labour Friends of Israel who would contribute funds to the Labour Government in 2003; and Herzl couldn’t foresee that people like Jewish Chronicle writers David Aaronivitch and Nick Cohen would rally within the British press for further aggression in the Middle East, namely, the Iraq War. 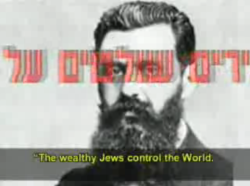 Herzl indeed, appeared to despise Jewish Power. “When the wealthy Jews play, the nations and the rulers dance”, he wrote with contempt. Pre Zionist writings by Herzl suggest that the promising Viennese Journalist was convinced that Anti-Semitism was actually good for the Jews : He thought that it would mount pressure that would lead Jews eventually to “adapt” and transform into Goyim by means of conversion (5:49). Later, when Herzl, changed his mind, and decided that Zionism was the ‘way forward’, he still thought that anti Semitism was a good thing, since it could only push Jews more urgently towards establishing the future Jewish State. And it seems that Zionism still benefits from anti Semitism. Apparently, Herzl’s paradigm is still in place. Bravely, the film elaborates on the similarities between Herzl and Hitler. It is rather clear that -- at least ideologically -- the two political thinkers shared a deep aversion towards Jews. It is important also to note that -- as much as this film protests against anti Jewish discrimination in Israel -- it hardly mentions the Palestinians or their plight. It totally neglects the crimes committed day by day against the Palestinian people. As one expects -- universal ethics hardly comes into play in Hebrew; not even in a film about Zionist discrimination and human rights abuse.